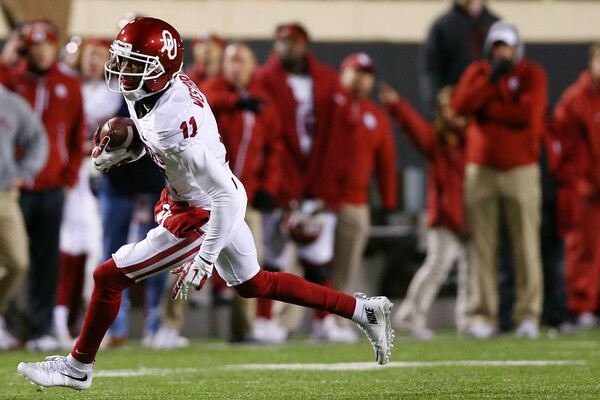 Dede Westbrook is one of three finalists for the Biletnikoff Award, presented by the Tallahassee Quarterback Club Foundation to the outstanding receiver in college football. Westbrook, a senior from Cameron, Texas, who is having one of the best receiving seasons in Big 12 history, leads all Power Five players in receiving yards (1,354) and receiving yards per game (123.1), and is tied for first with a school-record-tying 15 receiving touchdowns. Westbrook, who battled a hamstring injury during OU's first three games when he averaged 51.3 receiving yards per contest and did not score a touchdown, has exploded in eight games since. During that span, Westbrook has amassed 53 catches for 1,200 yards and 15 touchdowns. The 1,200 yards are the most ever by a Sooner in a eight-game stretch (next highest total is 1,070 by Ryan Broyles in 2011), as are the 15 receiving TDs. Not only does Westbrook have the most receiving yards in the country since Oct. 1, no player is within 73 yards of him. His 15 receiving scores have come, in order, from 67, 40, 71, 42, 47, 26, 8, 88, 49, 23, 41, 65, 29, 40 and 75 yards, for an average of 47.4 yards. The 15 TD catches over the last eight games are more than 44 teams have on the season. Only seven teams have more receptions of at least 60 yards this year than Westbrook's five. Westbrook has already more than doubled the Oklahoma single-season record for touchdowns from scrimmage (rushing or receiving) of at least 40 yards. Westbrook has 11 touchdowns from scrimmage of 40-plus yards this year, while the former OU record was five. Westbrook leads nation in receptions of 20-plus yards (24), and is tied for national lead in receptions of 40-plus (12), 50-plus (six), 60-plus (five) and 70-plus (three) yards. He has more total receiving yards the last eight games than Army, New Mexico and Tulane each have on the season. In Big 12 play, Westbrook ranks first in the conference in receiving yards (150.0 per game) and points (12.2 per game). His 150.0 receiving yards per Big 12 contest are 55 more than the next closest player (Oklahoma State's James Washington; 95.0). Westbrook, who registered four straight games of multiple TD receptions to start October (two at TCU, three vs. Texas, three vs. Kansas State and two at Texas Tech), has started Big 12 play by registering receiving totals of 158 yards at TCU, a school-record 232 vs. Texas, 184 vs. Kansas State, 202 at Texas Tech, 105 vs. Kansas, 131 at Iowa State, 88 vs. Baylor and 100 at West Virginia. He started returning punts Oct. 15 vs. Kansas State and kickoffs Oct. 22 at Texas Tech, and is averaging 19.8 yards on his four punt returns (had a 71-yarder for a TD against Kansas) and 28.4 yards on his eight kickoff returns.